Gary Roberts was the hero as his late double earned Pompey their first win of the League Two season today in a 2-0 Fratton Park victory over Colchester. The hosts, who began the day in 20th position following a run of two draws and a defeat from their opening three games, earned a much welcome three-point haul after Roberts picked himself up off the turf to convert the penalty he had won to send them on their way. The Blues playmaker had been clumsily felled by U’ substitute Drey Wright, who could have no complaints with the decision. 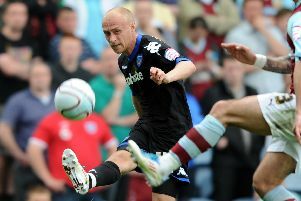 And as Fratton Park held its breath, Roberts stepped up to slam down the middle with 10 minutes left on the clock. Three minutes later he was celebrating again after latching onto substitute Conor Chaplin’s through ball to coolly chip advancing Colchester keeper Sam Walker and seal the points. Curtis Main, who was given a first league start up front at the expense of Michael Smith - omitted from the matchday squad altogether - was the first to threaten for the Blues. His early near-post flick drifted harmlessly wide from Roberts’ cross, though. And it was to prove a frustrating first half for the front man as a familiar dominant Pompey showing failed to bring about the all-important breakthrough. A succession of corners came and went for the hosts before they burst into life at the end of the opening 45 minutes. And it was that man Main who had and squandered two good chances to put Pompey ahead, with Danny Rose also going close to the opener. Main found himself alone in the box from Roberts’ cut-back but his low shot was well saved by Colchester keeper Sam Walker who then reacted superbly to keep out Rose’s follow-up effort with his feet. The ball broke to Main but he snatched at his chance to net with Walker grounded - firing a snapshot over the bar. The Blues started the second half as they ended the first - on top - with Carl Baker testing Walker’s reflexes. The loudest cheer of the day arrived on the hour mark when Chaplin entered the fray, alongside Noel Hunt, as Paul Cook opted to go with two up front for the remainder. The visitors, who were content to play on the counter, enjoyed their best chance with 20 minutes remaining as Craig Slater’s fierce strike was well saved - and gathered - by the previously untroubled David Forde. But it was Pompey - and Roberts - who would have the final say. The attacking talent won and then converted a penalty with 10 minutes left on the clock before collecting Chaplin’s assist in his stride three minutes later to chip home and seal the points. Colchester threatened a late response but Forde was equal to his task with a fine double save from substitute Chris Porter and Doug Loft late on ensuring a clean sheet would be accompanying the Blues’ three-point haul. All of that means Pompey sit in 14th position the table tonight.